Break out the BBQ for this Grilled Salmon with Garlic Lime Butter and eat like you’re on vacation! 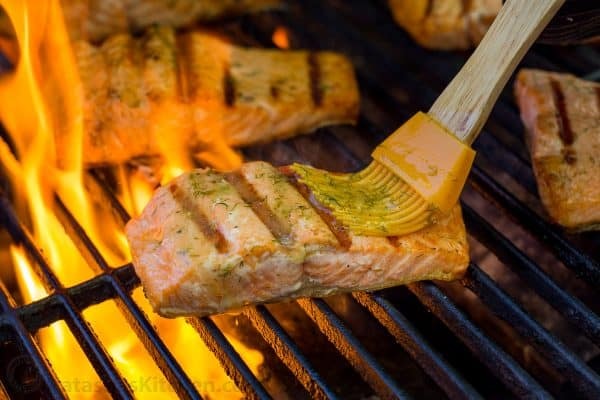 Grilling adds incredible smoky tones to salmon and the flavored butter takes it over the top with fresh summer flavor. A big delicious thank you to our friends at the Salmon Council for sponsoring this recipe. Your dinner guests will be humming over this salmon recipe. 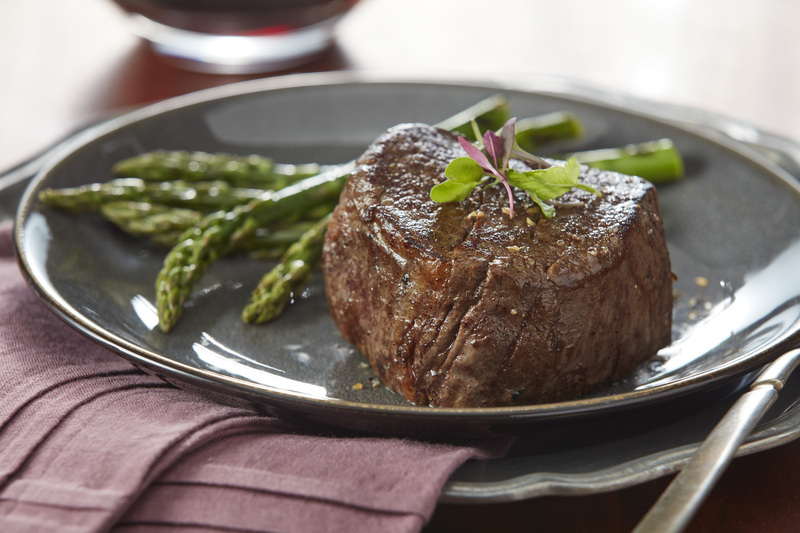 It will become your go-to for grilling season and you’ll make it again and again! 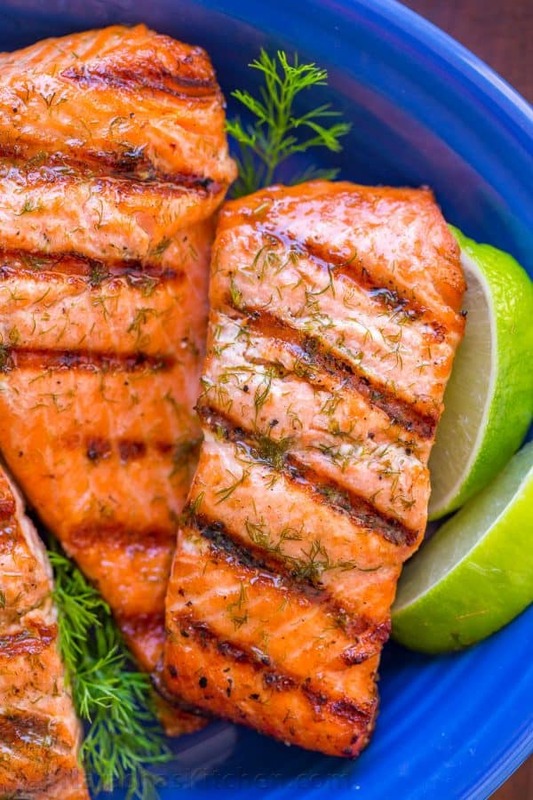 This grilled salmon recipe is easy-easy-easy with just 15 minutes of marinating time. 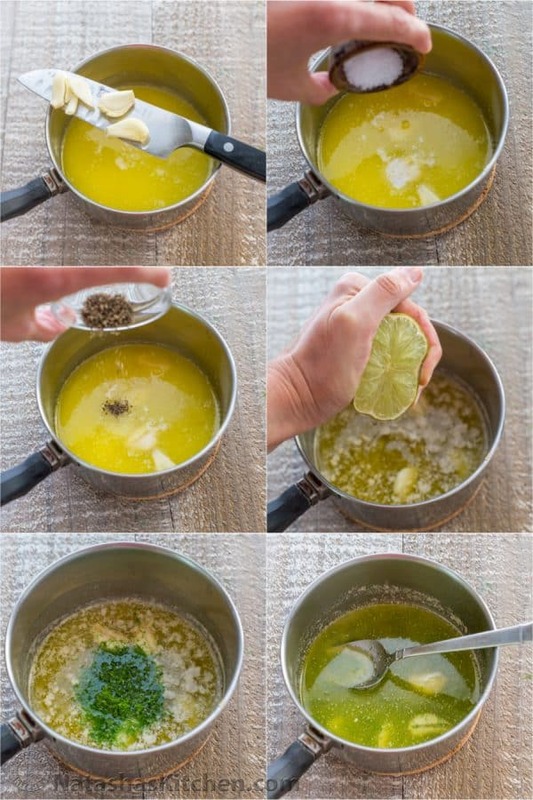 It’s quick and incredibly flavorful since you’ll use more of that sauce while it is sizzling on the grill, and then drizzle the reserved sauce just before serving which gives it unbelievable flavor! 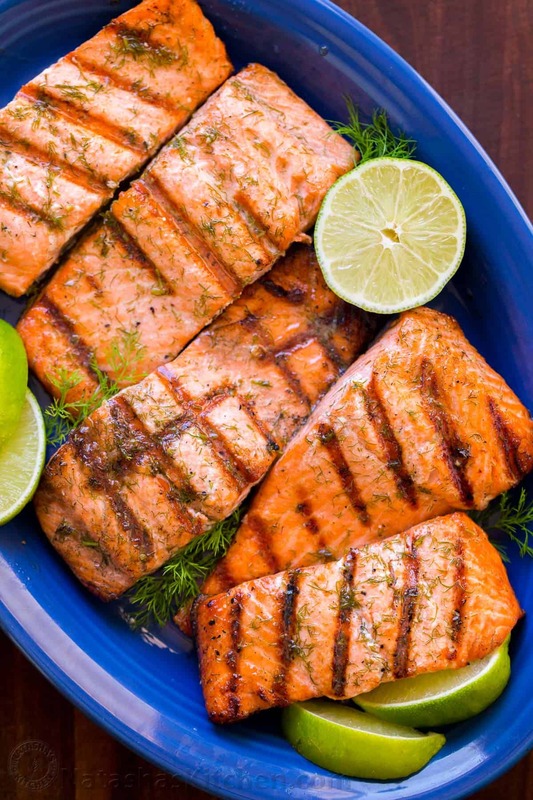 *When grilling salmon, be sure to buy skin-on salmon fillets. 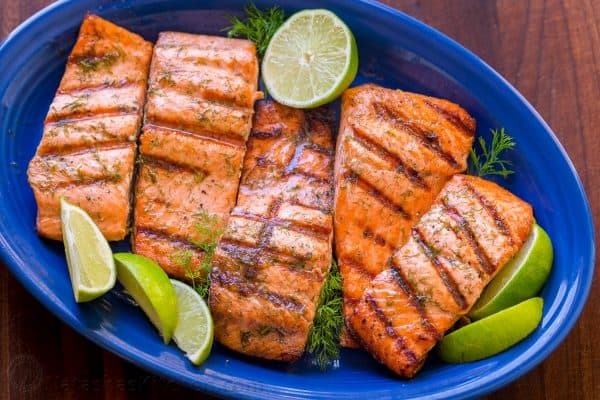 Salmon is very tender and flaky and the skin helps keep it together on the grill without falling through the grates. P.S. The butter in this recipe makes the salmon juicy and rich in flavor. Don’t worry about the amount because most of it get’s burnt off while grilling but all of the flavor is still there my friends. WINNING! 1. In a small sauce pan, melt 8 Tbsp butter over medium heat. Smash 4 garlic cloves with the flat of a large knife until squashed and add them to the melted butter along with 1 tsp salt and 1/4 tsp black pepper. Simmer 2 minutes or until fragrant. Add chopped dill and 2 Tbsp lime juice and remove from heat. Transfer half of the sauce to a small bowl. Reserve and set aside remaining sauce in the pan (keeping reserved sauce in the saucepan allows you to warm it quickly on the stove if needed just before serving). 2. Arrange salmon fillets on a platter skin-side-down and brush tops with 1/4 of the sauce from the bowl. Let salmon marinate in refrigerator 15 minutes while grill is preheating. 3. Preheat grill to medium/high (350˚F). Brush the hot grill clean and oil the grates**. Place salmon onto preheated grill, skin-side-down. Cover and grill over medium/high (350˚F) heat undisturbed, about 2 minutes on the first side. 4. Carefully flip salmon over (it helps to have a spatula to loosen it and tongs to flip it over), cover and cook another 2 minutes. Flip again and (while wearing the oven mitt and starting with the filets at the back), brush tops with 1/4 of remaining sauce from the bowl. Cover and continue grilling just until salmon is flaky and cooked through (another minute, or according to grilling chart below depending on salmon thickness). **How to oil grill grates: wear an oven mitt for safety and using long tongs, dip a folded paper towel in oil, then rub down the grates. 5. Remove salmon from the grill and drizzle with sauce reserved in the saucepan (if butter has hardened, heat just until melted). Garnish with fresh dill and serve with lime wedges so your dinner guests can squeeze on some fresh juice to serve. So ridiculously good. 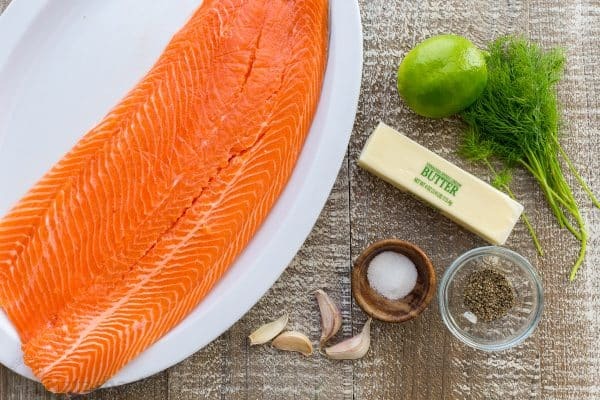 Print Grilled Salmon with Garlic Lime Butter 4.8 from 5 reviews Prep time: 22 mins Cook time: 8 mins Total time: 30 mins Break out the BBQ for this Grilled Salmon with Garlic Lime Butter and eat like you’re on vacation! 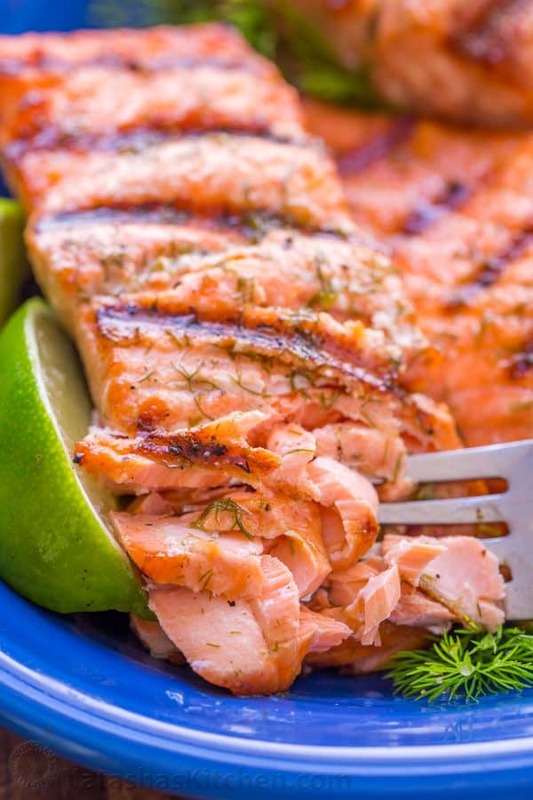 Go-To Grilled Salmon recipe – it excites your taste buds! Author: Natasha of NatashasKitchen.com Skill Level: Easy Cost To Make: Varies by Season and Price of Salmon Serving: 6 (6oz each) salmon fillets Ingredients ½ cup (8 Tbsp) unsalted butter 4 cloves garlic, smashed (NOT PRESSED) 2 Tbsp fresh lime juice from 1 lime, plus lime wedges to serve 2 Tbsp fresh dill, chopped, plus more to garnish 1 tsp salt (we use sea salt) ¼ tsp black pepper 2 lbs salmon (skin-on), cut into 6 (6-oz each) fillets Instructions In a small sauce pan, melt ½ cup butter over medium heat. Smash 4 garlic cloves with the flat of a large knife and add to melted butter along with 1 tsp salt and ¼ tsp pepper. Simmer 2 mins or until fragrant. Add chopped dill and 2 Tbsp lime juice then remove from heat. Transfer half of sauce to a small bowl. Reserve and set aside remaining sauce in the pan – you will use this for serving. 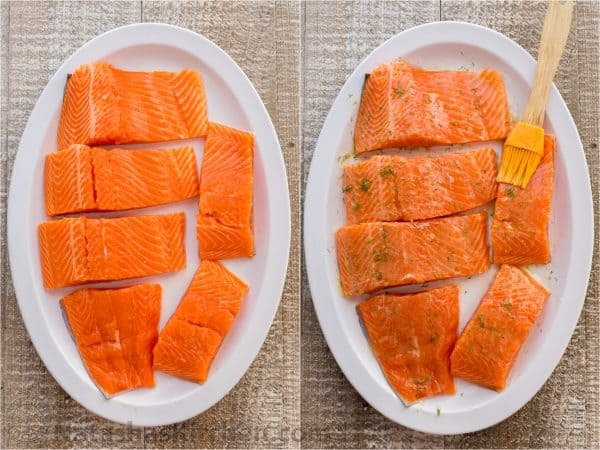 Arrange salmon fillets on a platter skin-side-down and brush tops with ¼ of the sauce from the bowl. Let salmon marinate in refrigerator 15 mins while grill preheats. Preheat grill to medium/high (350˚F). Brush the hot grill clean and oil the grates**. Place salmon onto preheated grill, skin-side-down. Cover and grill over medium/high (350˚F) heat undisturbed, about 2 minutes on the first side. Carefully flip salmon over (it helps to have a spatula to loosen it and tongs to flip it over), cover and cook another 2 minutes. Flip again and (while wearing the oven mitt and starting with the filets at the back), brush tops with ¼ of remaining sauce from the bowl. Cover and continue grilling just until salmon is flaky and cooked through (another minute, or according to grilling chart below depending on salmon thickness). Remove salmon from grill and drizzle with sauce reserved in saucepan (if butter has hardened, heat just until melted). Garnish with fresh dill and serve with lime wedges to squeeze over salmon if desired. Notes **How to oil grill grates: wear oven mitt for safety and using long tongs, dip folded paper towel in oil, then rub over grates. My entire family really enjoyed this salmon. My 2-year old was surprised by the taste at first (must have been the fresh lime that excited her taste buds) but she enjoyed it also! That is just the best feeling when your kids happily eat something you make and especially when salmon is full of brain and heart boosting Omega 3 fatty acids. YES!! This is a sponsored conversation written by me on behalf of Salmon Council. As usual, the opinions and text are all mine. Comments submitted may be displayed on other websites owned by the sponsoring brand so it would be amazing if you try it, love it and tell me all about it. P.P.S. Love Salmon?? Be sure to follow Hooked on Salmon on Pinterest and Facebook for more delicious salmon recipes!